Originally occupied by a supermarket, this 11,326sf office space was completely renovated by Lauer-Manguso & Associates Architects design team for the SKM Group advertising agency. Keeping in mind that “creative people need creative spaces” it was decided to leave the 20-foot high roof deck and roof joists exposed and painted. This would influence the design of other interior features, incorporating a “light industrial” look. 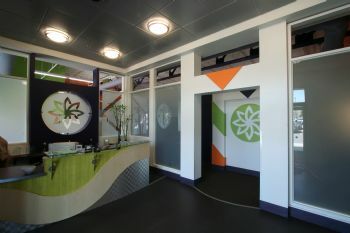 The office space features metal laminates and glass in the reception desk, diamond plate sheet vinyl floors in key areas, mechanical ductwork left visible to “float” over the workstations, and metal studwork ingeniously treated as a finished material to create circular bridging arches between full height walls and lower partitions. Perhaps the most striking aspect of SKM offices is the bold use of strong colors. From the bright and playful patterns of the desktop laminates to the saturated purple, orange and green hues of the walls, it becomes clear that colors are an important component of their work and by extension and important part of their environment. Other noteworthy design details include the blending of the letters SKM into the different elements of the reception area. A subtle “S” shape in the desk, an etched “K” in the glass behind, and a stylized “M” in the form of an archway leading to the interior.